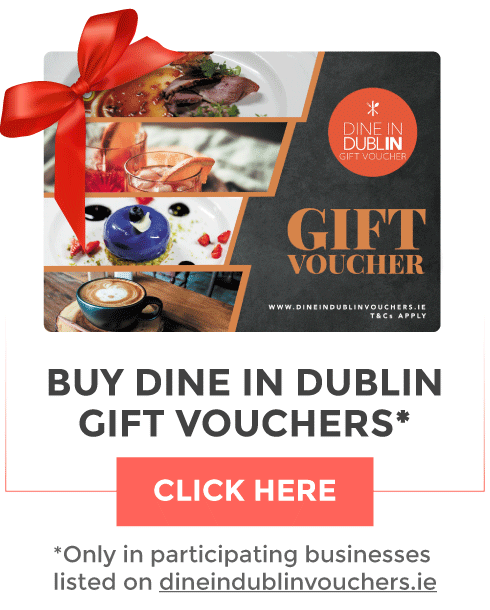 Dine in Dublin Gift Vouchers, the perfect gift for anyone who enjoys dining out in the city centre's favourite restaurants. The Gift Vouchers can be purchased in denominations of €10, €20 & €50. When buying the gift voucher customers can choose any value, but for example if a customer was to buy €150 they will receive 3 x €50 vouchers. The Dine in Dublin Gift Voucher is a nicely designed and printed voucher, making it very presentable as a gift to add that extra flourish to your card. The gift vouchers are SENT OUT TO CUSTOMERS BY POST with no additional charge. Allow 3 to 5 days for arrival. Restaurants participating in the initiative will accept the vouchers just like cash and in case that the gift voucher is more than the cost of the meal the restaurant will issue a voucher from them for the value of the remaining amount. Buying the gift vouchers online is simple. Just select a voucher value you would like, select the quantity and pay quickly and safely using Paypal. A full list of restaurants participating can be viewed here. Terms and Conditions for using these vouchers can be found here.